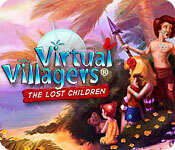 Virtual Villagers: The Lost Children Walkthrough will help you guide your tribe as they rescue a group of lost children and help them survive and prosper. Use our comprehensive Virtual Villagers Walkthrough to help lead your villagers as they solve all new puzzles and hidden mysteries on the west shores of the island. After finishing Puzzles 6 and 10, drop a totem in the center of the uncovered mosaic to reveal a piece of the gong. There is no matter in the order in which the food/water/or herbs are added.